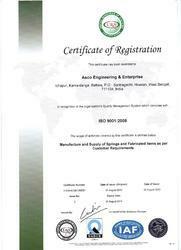 Established in 2005, we Asco Engineering & Enterprise are amongst the prominent manufacturer and exporter of an extensive range of Engineering Components and Springs. These are manufactured using premium quality raw material and are available in various specifications. To achieve maximum client satisfaction, we also offer OEM service on our range of product. Our product range includes Compression Springs, Helical Compression Springs, Industrial Springs, Die Springs, Industrial Coils Springs, Coil Springs, Extension Springs, Coil Springs, Tension Springs, Helical Springs, Railway Bogie Springs, Torsion Springs, Shaft Sprocket, Volute Springs, Constant Force Springs, Leaf Springs, Valves Springs, Automotive Springs, Grid Springs & Coupling, Resilient Springs & Coupling, Wire Springs and Conical Springs. We have a sound infrastructure well equipped with all requisite tools and latest machines which enable us to meet the bulk requirements of our clients. At this infrastructure, we have employed a team of talented and dexterous professionals which work solely to provide our clients a quality range of product which is in compliance with their specifications. Under the guidance of Mr. Kakan Ghosh, we have a gained a prominent position in the world market. His strong sense of professionalism and ethical business policies has helped us to garner a huge clientele all across the world. 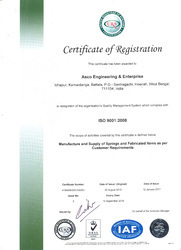 Our organization is engaged in manufacturing and exporting a comprehensive range of Engineering Components and Springs. The range of product we offer includes Compression Springs, Helical Compression Springs, Industrial Springs, Die Springs, Industrial Coils Springs, Coil Springs, Extension Springs, Coil Springs, Tension Springs, Helical Springs, Railway Bogie Springs, Torsion Springs, Shaft Sprocket, Volute Springs, Constant Force Springs, Leaf Springs, Valves Springs, Automotive Springs, Grid Springs & Coupling, Resilient Springs & Coupling, Wire Springs and Conical Springs. 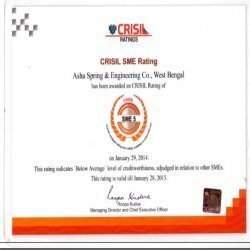 We are a renowned organization engaged in manufacturing and exporting of a wide range of Engineering Components and Springs. These are widely appreciated by our clients all across the world for their superior quality and cost effective prices.